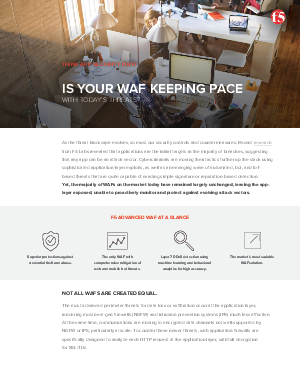 > F5 Networks Inc > Is Your WAF Keeping Pace With Today's Threats? As the threat landscape evolves, so must our security controls and countermeasures. Recent research from F5 Labs revealed that applications are the initial targets in the majority of breaches, suggesting that any app can be an attack vector. Cyber criminals are moving their tactics further up the stack using sophisticated application-layer exploits, as well as an emerging wave of automated, bot, and IoT based threats that are quite capable of evading simple signature or reputation-based detection. Yet, the majority of WAFs on the market today have remained largely unchanged, leaving the app layer exposed, unable to proactively monitor and protect against evolving attack vectors.